Bob is not working while he is undergoing radiation and chemo for CTCL. The cats feel like they have won the Bob lottery. When he isn't commuting to treatments he is home keeping them company. Fortunately Bob remains fairly comfortable through the treatments - his skin is a little redder, and he is tired at times, but no nausea or other common chemo issues. He may lose his hair and fingernails. It's very strange to come home and find Bob already there. Since we've met he has worked second shift. I guess I've won the Bob lottery too! 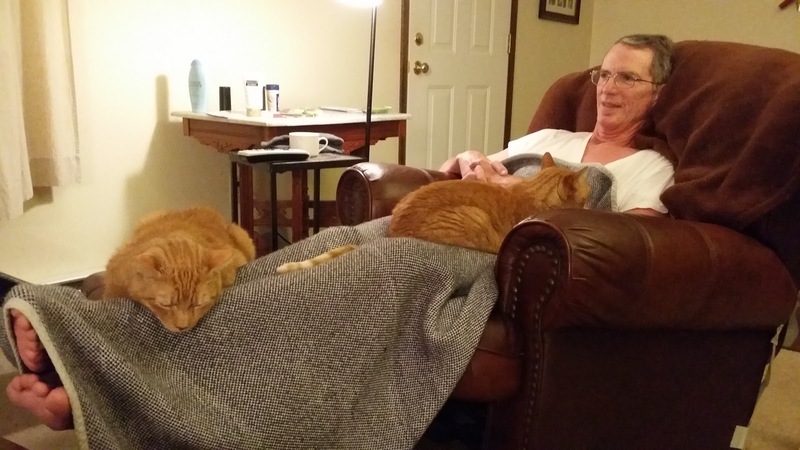 I had surgery a few years ago and my two (then) cats cuddled me hard for the three recovery days. It really says something when normally nonchalant animals offer both warmth and companionship. Hope they help keep his spirits up! Warm cat lap therapy can't hurt!